For the past two days I have run at record low temperatures. 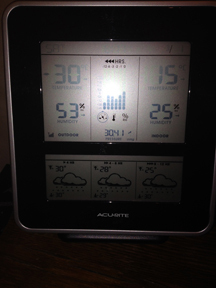 Prior to this, the coldest I had ever gone for a run was -23. 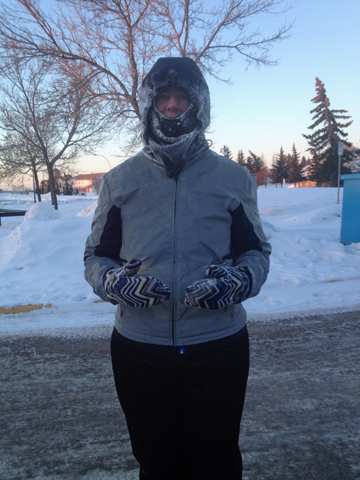 Yesterday I ran to the gym and it was -26 degrees Celsius with the wind chill putting it in the low minus 30’s. This morning I ran to the pool for my aqua aerobics class and it was -30 degrees without the windchill….I don’t know how cold it was with the wind chill factored in. It has been so cold all week that I haven’t been able to take the dogs with me and Wally is very unhappy at being left at home. When I put on my workout clothes he paces at the front door in anticipation of our adventure to come. I feel so guilty when he looks at me with those big, sad, brown eyes when realizes that he isn’t going with me. I had on 3 layers of pants, on my upper body I had on 5 layers if you count my bathing suit, two layers of mitts and I had a head band, balaclava and hood to keep my face/head warm. The only parts exposed were my eyes and the bridge of my nose. Don met me at the pool with a x-large hot Timmies to warm me up. He took this picture of me all covered in frost. Even my gloves had a layer of frost on them. The good news is that it’s only 9am and I’ve had two workouts, watched a beautiful sunrise and I have the whole day ahead of me. stupid cold here too…OMG you are ambitious!!! I hate to even go outside to get into my car……Kudos to you girl!! !